St. Augustine history is about as rich as it comes. Understanding the city's past makes for an even greater appreciation for its current standing. It's apparent when you visit almost any of the local businesses, attractions, etcetera, it's almost tangible when you walk down the cobblestone streets, and it's right there for all to admire in the many museums and galleries. This is one of the main reasons St. Augustine is such a major tourist attraction. You don't have to know the history of St. Augustine to want to visit, but if you like a little education from time to time, read on. St. Augustine is located in the northeastern part of Florida on the coast. It's often referred to as the oldest city in the nation, as it's the "oldest continuously occupied settlement." The city was founded in 1565, and has both Spanish and British roots. It officially became U.S. territory in 1822, and has grown into its renowned spot on the map ever since. Without even trying, you'll find historic, original homes still standing, and reconstructed buildings meant to preserve their beauty and era. 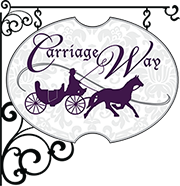 Carriage Way invites you to come stay with us in one of our nine charming guest rooms and see firsthand what St. Augustine Florida is all about. You'll have the opportunity to have an up-close-and-personal experience with St. Augustine's past. We will do our best to see to it, or at least, fill you in on what you want to know. Knowing where you come from and where you've been is essential to where you're going, which is why we are grateful for St. Augustine history. Carriage Way, a premier St. Augustine inn, looks forward to leaving our mark on the city.